Film Directing Fundamentals gives the novice director an organic methodology for realizing on-screen the full dramatic possibility of a screenplay. Unique among directing books, Nicholas Proferes provides clear-cut ways to translate a script to the screen. Using the script as a blueprint, the reader is led through specific techniques to analyze and translate its components into a visual story. A sample screenplay is included that explicates the techniques discussed. Written for both students and entry-level professionals, the book assumes no knowledge and introduces basic concepts and terminology. Appropriate for screenwriters, aspiring directors and filmmakers, Film Directing Fundamentals helps filmmakers bring their story to life on screen. 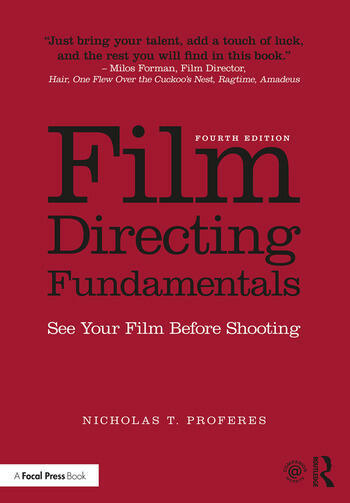 This fourth edition is updated with a new foreword by Student Academy Award-winner Jimmy Keyrouz, who studied with author Nicholas Proferes, as well as an enhanced companion website by Laura J. Medina, available at www.routledge.com/cw/proferes, which features new supplemental material for both instructors and students, including two new analyses of contemporary films—Wendy and Lucy (2008) and Moonlight (2016)—study questions, suggested assignments and exercises, as well as the instructor’s manual written by Proferes in 2008. Nicholas T. Proferes was the director/cameraman and editor of Free at Last, a 90-minute documentary on Dr. Martin Luther King, Jr., which was awarded Best Documentary at the Venice Film Festival in 1969; director of photography and editor of Wanda, a feature film directed by Barbara Loden, awarded Best Picture at the Venice Film Festival in 1971; and co-producer, director of photography, and editor of The Visitors, a feature film directed by Elia Kazan. In 2008, his screenplay Romeros, Julieta, & the General won best screenplay at the Los Angeles Greek Film Festival; and in 2009, his screenplay Handsome Harry, directed by Bette Gordon, premiered at the Tribeca Film Festival. He is Professor Emeritus at Columbia University. Laura J. Medina is an educator and filmmaker. She has professional production credits on a wide variety of productions including studio and independent feature films, documentaries and TV series. Laura directed three short narrative films, screened at film festivals all over the U.S. Since 2011 she has been an Assistant Professor in the Department of Film and Theatre at the University of New Orleans, where she teaches producing, directing and advanced production. Laura has a BA in Political Science from Antioch College, an MFA in Filmmaking from New York University, and is a member of the Directors Guild of America.